Bass fishing in Ontario has evolved to a near cult popularity with so many anglers through the years that there have been so many products made, clubs formed, and articles written about it. 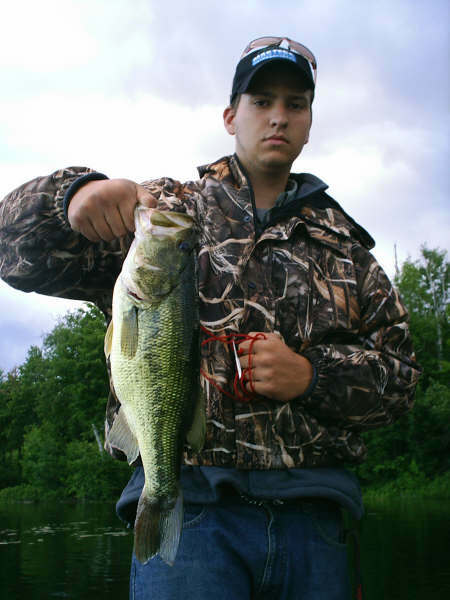 Here you will read about the types of Ontario Bass fishing lures you can use to catch them. Also, there is also a list on the necessary equipment to have when going bass fishing within the province. The type of bass that will bite almost anything is the largemouth bass. Minnows, worms, or other live bait, plus poppers or streamers presented with a fly rod, or plugs thrown from a casting or spinning rod are ways where they can be caught. Since bass are usually associated with weeds, a weedless bait will often be necessary. Morning and evening are the best fishing times when warm months come. They usually like to stay in warm water and warm weather. Drop and splitshotting is another popular technique for Small and Largemouth Bass. Smallmouth bass pound for pound are the scrappiest fish of all fresh water bass. They are usually associated with a rocky stream, deeper water or lake environment where its favorite food, the crayfish, is plentiful. The best lake fishing takes place in the month in June just after the spawning season, and in early fall. Natural lure like hellgrammites, dragonfly larvae and crayfish are especially useful during early morning or late evening. Most likely, the best artificial lures are those who are used on the surface. Light tackle is ideal and 8-12lb line is usually more than enough to enjoy a good fight into the net. Fish quietly, casting toward rocks or logs, keeping the rod tip up and the line tight. Many fishermen debate on the colors used for their lures and variances in colours throughout the day can make a big difference. • Fishing Rod. The most important piece of equipment and should be chosen with care. A basic spining rod-and-reel set is enough for beginners. It is necessarily important to have more featured materials. The most important is that you should learn how to use the rod and be comfortable to it before moving into another difficult type of equipment. Professional fisherman can experiment different types of rod for them to know what works best for them. Many pros and diehard bass anglers use baitcasting reels with 10-20lb mono line with a medium to medium heavy rod to yank bass out of the weeds and other forage. When buying a fishing rod, know before you enter the store what kind of fishing you'll be doing, and under what conditions. Rods come from different varieties of materials, from wood laminates to fiberglass to carbon fiber. Rod handles should fit securely in your palm, and practice casting with the rod, to test how flexible and easy to use it is. In addition have the proper length of the rod. For using lighter lure, or catching tiny fish, a 4 inch to 6 inch rod is advisable to use. For using larger lure, which gets larger fishes or casting longer distances, a rod of at least 6 inches may be required. • Waders. It is a water- resistant covering you wear over your pants to keep them dry so you can wade out into the water. A lot of are made like overalls, covering the chest and the legs, and with boots attached, for ultimate defense. Make sure the boots are warm and secure, to supply better balance while walking on wet rocks. • Fishing Vest. Contains several pockets for storing fish equipments and your hands are free to manage the fishing rod. Also, should you have to wade out into the water, wearing a vest will let you to have all of your gear with you at all times. Make a decision beforehand which gear is necessary; if you store too much in the vest, it may make it too heavy to wear, which could bring you down. • Tackle Box or Fly Box. In fishing it requires a lot of supplies and you need a something big to store all your gears. Spend in a durable tackle box, in which you can store your entire lure, keeping it easily to get to. Styles are classified into simple and inexpensive, and large and costly. Fishermen may only need something small, but the more advanced fishermen may want something handier. Furthermore, you should consider a fly box. Small enough to fit a vest pocket and allows you to keep them with you as needed.